Brothers, our “June” meeting will be held Wednesday, May 30. We are rescheduling from the usual date because St. William is not accepting facility reservations during the first week of June. This will be an important meeting as officer elections will be held. Please mark your calendar and plan to attend. Usual time and location – 7:30 p.m. at the Fr. Michael J. McGivney Pavilion at St. William. Thanks! As another opportunity for Knights and their loved ones to have fun and spend time together, Council No. 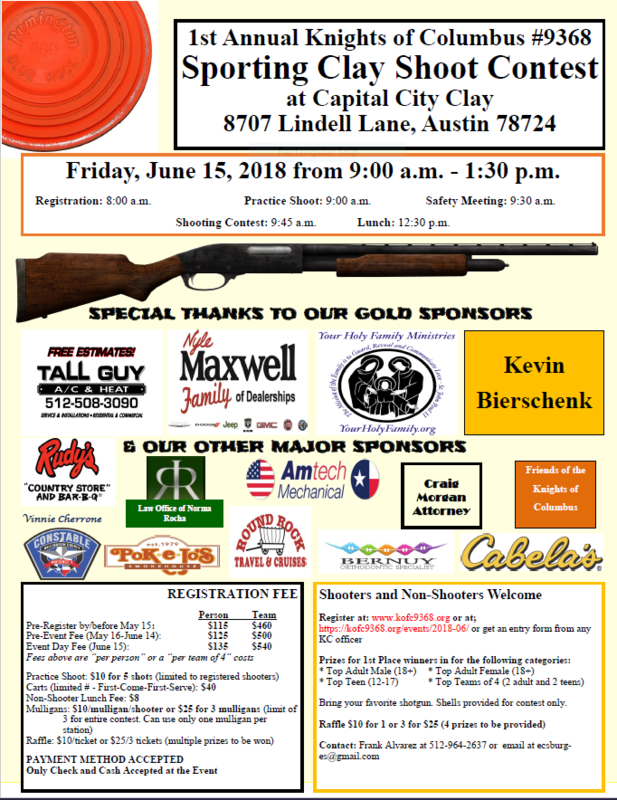 9368 is hosting its first annual Clay Shoot competition. Click here for the waiver form. Click here to see the prizes that will be awarded. Update: This food drive brought in over 12,000 lbs. of food to the Society of St. Vincent de Paul. Many thanks to the St. William administration and community for supporting this food drive! Although the Lenten food drive is complete, collection boxes are permanently located in the St. William narthex any time you may want to donate throughout the year. The Chisholm Trail Council will be organizing and coordinating a parish-wide food donation drive to benefit the Society of St. Vincent de Paul at St. William – helping those most in need in our community. We will collect all food donations throughout the season of Lent, which begins Feb. 14.